Music festivals have become increasingly popular over the past decade and have evolved into a major social event for the millenial demographic. Marketers have taken notice, but it's not as easy to advertise at music festivals as you might think. With limited advertising space on the ground and increasing competition to sponsor these events, advertisers are using creative tactics to appeal to the millenial market. Aerial advertising presents a less competitive, eye-popping way for brands to create a memorable marketing campaign that is bound to reach the millennial demographic at music festivals. Flying in a clutter-free space, aerial billboards own the sky, and are capable of being seen by thousands of festival-goers on the ground below. In fact, there’s a 70% rate-of-recall for the messaging on an aerial ad – that’s higher than any other form of traditional advertising! Coachella, a world-renowned music festival, is a three-day weekend event that welcomes nearly 200,000 attendees to Indio, California. 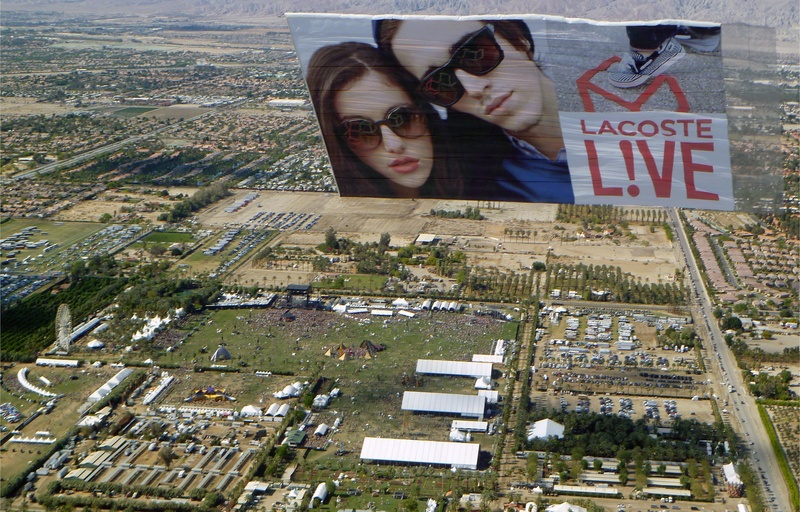 Its celebrity status, coupled with its intoxicating line-ups and events, makes Coachella a tailor-made marketing platform for aerial advertising. An aerial banner produces a unique experience and provides entertainment for the audience. This medium connects the brand to the Coachella experience and gets the audience interested to look up, take notice, and enjoy the campaign. Aerial advertising brings value to the brand because it ensures the campaign is visible over the entire event. The flight grants absolute banner exposure, imprinting the brand’s name and advertising messaging on the minds of all in attendance! Similarly, another notable festival beloved by millennials is Ultra Music Festival hosted in Miami, Florida. Miami is an ideal city for aerial advertisements because of its famous beaches and buzzing tourist and nightlife attractions. 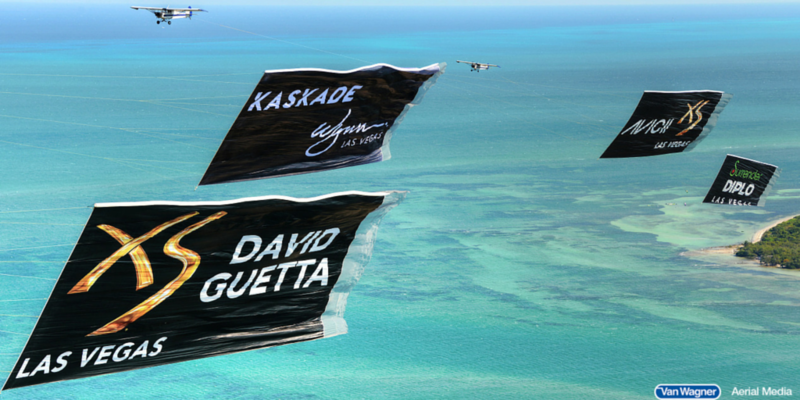 With an increase in tourism by nearly 300,000 people during Ultra weekend, utilizing aerial advertising is paramount. With the right messaging, your banner can be flown year-after-year at Ultra and other music festivals across the country! Ultra is a three-day electronic dance music event that attracts an internationally acclaimed lineup and targeted audience. Showcasing the most distinguished DJ’s in the industry among talented up-and-coming artists, Ultra produces an electrifying festival with an energized audience. Millennials are already exposed to the constant bombardment of advertisements, but advertising from a new and effective medium will capture the attention from the Ultra audience. At Van Wagner Aerial Media, we are able to perform formation flights which include multiple aerial billboards flown staggered, one after the next that creates a show-stopping spectacle in the sky above. Brands have the opportunity to create a compelling campaign that will make an impression on the consumer long after the ad has flown. Lollapalooza is yet another music festival that 20-30 year olds look forward to. Taking place in Chicago, Illinois, this three-day festival hosts a variety of music genres that influence this demographic. Ticket sales skyrocket upon the release of the lineup because the hype of the festival is so magnificent. Each year, Lollapalooza is packed to capacity and entertains a crowd of nearly 200,000 people. This presents tremendous opportunity for an unforgettable aerial advertising campaign. We have a variety of banner options that have had great successes flying at music festivals. We’re not talking about those dinky trailing letter ads you may have seen flying over the beach. 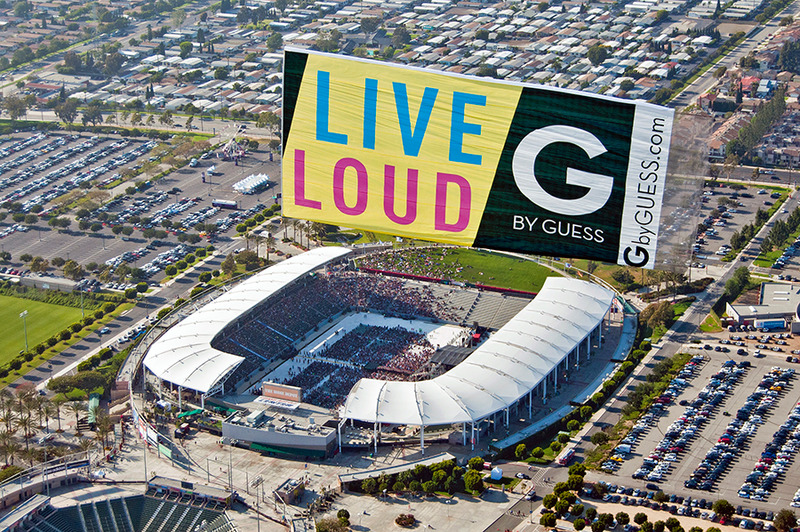 Our aerial billboards are massive, 5,000+ square feet, and campaigns are fully-customizable. Available in a variety of shapes and sizes, aerial billboards can also come equipped with interchangeable messaging and trailing letters allowing for tailored, multi-campaign use. They can even be used to complement brand ambassadors promoting on-site at the event! These banners establish a dominant presence during the festival and connect with show-goers. Millennials are constantly looking for something trendy and unique, so aerial advertising is the perfect medium to differentiate from the usual advertising tactics. Flying with a Van Wagner Aerial Media during a music festival will generate great success with festival-goers and their association to the brand. Outdoor music festivals invite large crowds of people to celebrate fun, live music and aerial advertising is the perfect medium to market your brand to the crowd. Come join the fun and fly with Van Wagner Aerial Media during these epic celebrations! It’s easy to get started, click the button below for a free quote today!